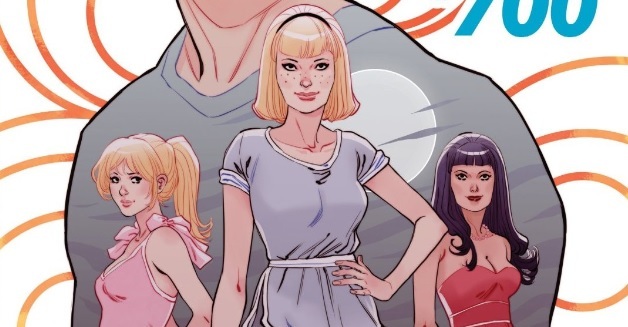 When Mark Waid and Fiona Staples relaunched Archie a few years ago they had the daunting goal of modernizing the franchise without losing its classic charm, but one thing they didn’t have to contend with was the influence of a totally different reboot launching at the same time. As the first new major run of Archie to launch in a post-Riverdale world, though, Archie 700 and its creative team of Nick Spencer and Marguerite Sauvage have the specter of the popular television show hanging over their heads. It’s fascinating to see how Spencer and Sauvage incorporate elements from Riverdale into their interpretation of Archie’s world, all without losing any of the heart, or even innocence, that’s made Archie Andrews such a beloved character for the past 70 years. The Riverdale influence on this book is obvious. Jughead’s newfound talent for writing — and indeed, his narration that fills the issue — is all straight from Riverdale, but so is his design. Jughead already received a pretty significant glow-up when Staples redesigned the character, but Sauvage takes things a step further, not only making him downright pretty, but incorporating the look of his Riverdale actor Cole Sprouse into his design as well. 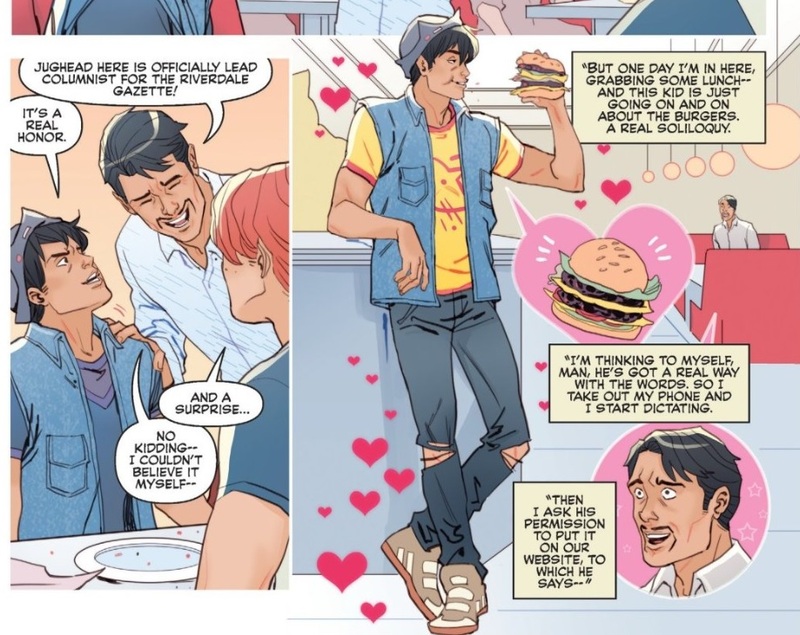 Yet, he’s still recognizable as comics-Jughead in a way his Riverdale counterpart’s never been, chowing down on burgers and psychoanalyzing/criticizing his friends’ lives like he’s always done. It’s a smart balance between old and new. The most Riverdale-esque element Spencer adds to Archie 700, though, is mystery. Each season of the show has essentially revolved around a murder mystery of sorts; Archie 700 revolves around a bevy of small mysteries, one for just about each core member of the cast. Spencer, though, grounds these mysteries in typical teenage experience. Archie’s been acting strange? It’s because he has a new girlfriend that isn’t Betty or Veronica. What’s up with Jughead? He has a job! They’re shocking answers, but they’re still small in scale and true to the characters. Spencer also has each mystery stem from events that took place over summer vacation, which couldn’t be more “Archie.” Summer vacation is nonexistant for adults, and seems short and meaningless to them, but it’s a period that’s powerful, vast and transformative, to a teenager. The mysteries of Riverdale are the darkest impulses of the world intruding into a supposedly idyllic community; the mysteries of Archie 700 are the kind that stem from the growth any person undergoes as they get older. More than anything, though, I admire Spencer and Sauvage’s pacing. It’s only the first issue and already two of these secrets have been revealed. That bodes well for future installments, guaranteeing that the creative team not only has answers to the questions they’re posing, but that they’re willing to reveal them at the right time instead of dragging them out. Spencer and Sauvage seem just as, if not more, interested in exploring the ramifications of these secrets as they are teasing them, and not only is that just plain ol’ smart storytelling, but it avoids many of the problems Riverdale fell into during its sophomore slump of a second season. So Spencer and Sauvage have found a way to incorporate new takes on the world of Archie into their run, appealing to fans who may have decided to check out the comic thanks to the TV show, while still remaining true to the spirit, heart, and innocence of their source material. Their approach has me excited for how they’ll continue to explore and expand Archie’s world as the series continues.